News, general info, reservations, links. This event will be like the last one. When: Saturday, Apr. 20. The course opens at 11:00 AM. We'll have a class roughly around 11:30 AM. If you can't make it for the class, no worries, we'll make sure you get all the help you need. The last possible start time is 2:00 PM. The course closes and pick-up starts when the last participant returns but no sooner than 2:00 PM and no later than 3:00 PM. Where: Carolina North Forest - East (aka Municipal Drive). From Martin Luther King Jr BLVD, take Municipal Drive and continue on it as it becomes a gravel road. Meet close to the parking lot at the end. Parking lot GPS: 35.936168 -79.065907). Link to Google maps. There will be orange and white ARDF signs to lead you to our meeting place. Optional registration: The registration page is here. You don't have to register, but it helps us if you do and it will speed up getting your equipment when you get there. We provide the map, compass, radio receiver, head phones, and course timing card. Have a question? Send email to ksears (at) chccs (dot) k12 (dot) nc (dot) us. Some pictures from the Spring 2019 events. Clicking on the pictures will bring up the event reports and more pictures. Some pictures from the Fall 2018 events. 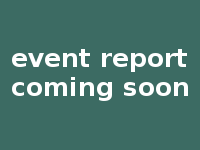 To see more of what we've done, check out our main ARDF event report list. Check the announcements for which location is being used. CNF - Seawell Elementary School: Take Seawell School Rd to the Seawell Elementary School parking lot (GPS: 35.9401 -79.0788, enter these coordinates in the search field of maps.google.com) and meet on the edge CNF. CNF - Municipal Drive: From Martin Luther King Jr BLVD, take Municipal Drive and continue on it as it becomes a gravel road. Meet close to the parking lot at the end. (Parking lot GPS: 35.936168 -79.065907, enter these coordinates in the search field of maps.google.com or click this link). Follow the orange & white ARDF signs to our meeting place. What are CHCCS ARDF events? Welcome to the main page for Chapel Hill-Carrboro City Schools ARDF. The page is hosted on the islandcreativetime web site, the family web site of Kelly Sears and Patrick Sears. For comments, suggestions, and questions; please contact ksears(at)chccs(dot)k12(dot)nc(dot)us. News is first posted at the top of the page. As new items get posted, we move earlier news here with the posted date in italics. For event older news, see the news archives page. Plan's for May-4 have been finalized. It will be a Sprint. There will also be a small foxoring for newcomers. All event dates are the same as before. Apr-6 - 80m Classic. Done. Apr-20 - 80m Classic. Next event. May-18 - 2m Classic or 80m Classic. Link to current ARDF calendar. Apr-6, 80 m Classic event report posted. We had a super time. ☺ Check out the event report here. Next Event. The next event is on Saturday, April 6. You can start any time between 11 AM and 2 PM. We'll have a class at 11:30. If you're new and can't make it for class, no worries, we'll make sure you get all the help you need. We'll meet at our usual location at CNF - Municipal Drive. Parking lot GPS: 35.936168 -79.065907 . google maps Follow the orange and white ARDF signs to our meeting place. You can register here. You don't have to register but it helps us and speeds your sign-in when you get there. All CHCCS high school and middle school students and families welcome. 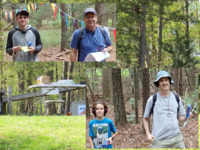 CHCCS ARDF Spring 2019 Season. Dates: April 6, April 20, May 4, May 18. For older news, see the news archives page. What are CHCCS ARDF events? 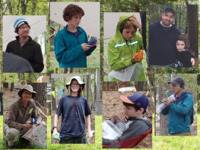 This is a general introduction to the Chapel Hill-Carrboro City School ARDF events. It explains what ARDF is, what will happen in an event, what you need to bring. If you have never been to one of our ARDF events, this is the first place to look. Receiver reservation. This page acts as both a registration for events and a place to reserve receivers. You don't have to register; you can just show up. It's totally fine. But you'll find it's better for everyone to register for events. It guarantees you'll get a receiver. It gives us your email address so that we can notify you of any last minute changes. It tells lets us know the minimum number of maps to print for the event. It speeds up sign-in when you arrive. Current ARDF calendar. This is our current ARDF calendar. It lists our ARDF events. It also lists some other ARDF and school events. Past ARDF calendar. This lists ARDF events from previous years. ARDF event report list. This is a more in-depth list of ARDF events from previous years. It has links to all the event reports and pictures. IslandCT home page. The Island Creative Time home page (IslandCT for short). This is the family home page for Kelly Sears and Patrick Sears. It deals with science, technology, education, and nature. It has a blog and a podcast. It is on hold for a couple months. But we have plans for updating it before the end of the year. BOK ARDF events (aka Radio-O). BOK events are starting on May-13. So here is a bit of information about these events. The first place to go for BOK information is the BOK home page. It has event announcements, BOK news, and useful links. BOK mostly hold orienteering events. 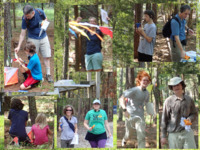 Give orienteering a try. It's much fun. BOK events are not school events but everyone is welcome to "open" BOK events. And all currently planned BOK ARDF events are "open". Regular BOK fees apply. Check the BOK website for up-to-date fees. For people that aren't BOK members, we expect the following fees: $15 per entry if you bring a whistle, $16 if you need to buy one. The entry includes one map, one finger stick, and one receiver. Several people can go on a single entry. Extra maps are $2 each. Registration for BOK ARDF events is required and must be done with BOK. There will be a link in the BOK event announcement on their home page. Or you can go directly to the BOK registration page . On the BOK web site, you will see Radio-O mentioned. 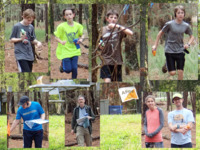 It stands for Radio-Orienteering and it's just another name for ARDF.